Limited Edition 11x14" size pen and ink print from hand-drawn original of Tillman Hall on the campus of Clemson University in South Carolina. 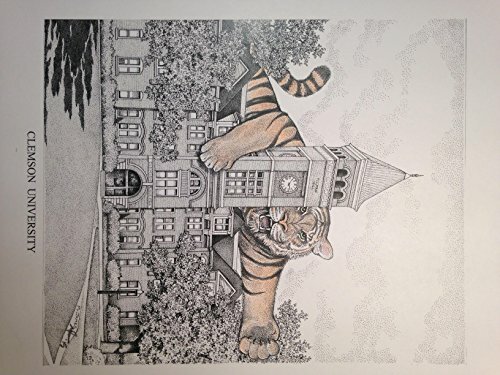 The scene depicts Tillman Hall; the most iconic building on campus, with a larger-than-life tiger that is ready to defend its home. Prints are from a limited run of 500 prints and are signed and dated. I'm a graduate of Clemson so I'm kind of proud of this one! Each print is an original with a hand-colored tiger, so there may be very slight variations from the image shown. Your purchase includes print, foam-core backing, and about-the-artist flyer within an acid-free packaging.